Interview with Fabrizio W. Luciolli, President of the Atlantic Treaty Association and President of the Italian Atlantic Committee. The interview was conducted on the 2BS Forum in Budva, where Luciolli was one of the participants. European Western Balkans: How do you see the consequences of Montenegro’s accession into NATO – both for Montenegro itself and for the region, and the Euro-Atlantic integration of the countries of the region? Fabrizio W. Luciolli: It is a great success. It is a successful story which we need, particularly in this region. And it happened in a very fast way. If you look to the situation of Montenegro at the beginning of the NATO adhesion process and how the country and the region are today, you can acknowledge an impressive development. Moreover, the NATO adhesion was stabilizing not only Montenegro but the region itself, in spite of the serious attempts of destabilization coming from abroad. Unfortunately, in recent times, the international community has neglected too much what was going on in the Western Balkans. The security scenario became more complex than 10 or 20 years ago, as testified by the today’s threats and challenges coming from foreign fighters, terrorism and organized crime, and by roots which are in many cases interconnected. It is time to come back and to look carefully to the security challenges of this particular region, as there is an “unfinished business”. In this framework, Montenegro represents a successful story of a country that has been able to comply with all the NATO standards and requirements agreed in its Membership Action Plan. The Strategic Defense Review has been accomplished and it is an example and a lesson learned – a positive one – for other countries in the region. In fact, in a complex world in which everything goes faster in respect to the past, and is interconnected, to remain static means to roll back. If we look at some other countries of the region, which remained blocked by the problems of 10 years ago, we can evaluate the consequences: Montenegro integration process was able to attract foreign investments and made the country more stable and developed and stronger enough to reject the attempts of destabilization coming from abroad, while in other countries of the region these attempts are putting at risk the democratic development of the civil society. EWB: Many people claim there can be no EU integration of the Western Balkans states without NATO integration – the country first needs to become a member of NATO before it becomes a member of the EU, or the two process have to go hand in hand. How do you see the relation of two processes for the Western Balkans states? 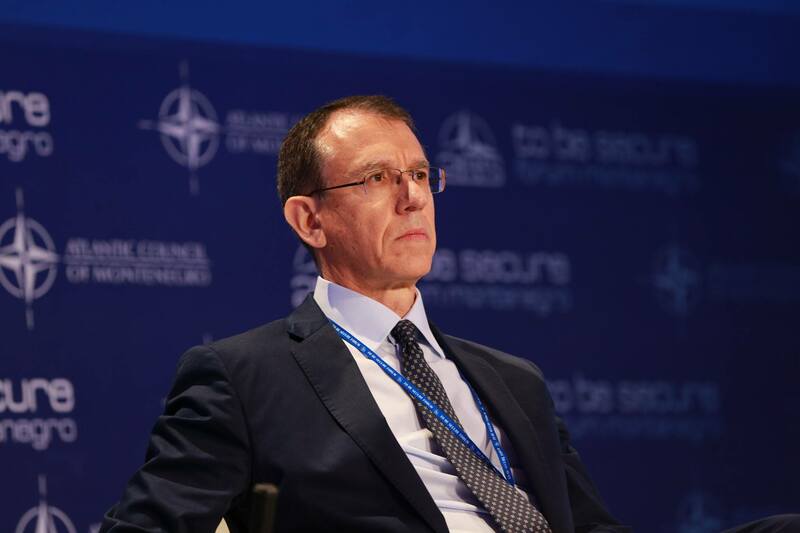 FWL: The NATO and EU integration processes are, for sure, interconnected, because it is clear that the Western Balkans are part of Europe and of the Euro-Atlantic security system as well. Moreover, security, economic and social development, and respect of rule of law must go hand in hand. You cannot have security if you do not have the economic and social development, but at the same time, entrepreneurs will not come to Montenegro or to other countries of the region if they cannot afford on the respect for the rule of law and there is no security framework. All these processes are interconnected. It is true that NATO security and stability usually paved the way for democratic reforms and economic and social development of the country. Thus, facilitating also the EU integration process that has many requirements in the latter fields. However, in the Western Balkans there is also a different path chosen by Serbia. At present, Serbia has a strong partnership with NATO, but maybe it will pave the way towards the EU faster than the cooperation with NATO. In conclusion, while the history of the Western Balkans is telling us that NATO is usually opening the way for the EU accession, this is not a mandatory rule. EWB: How important do you consider the Western Balkans for European security? FWL: It is of paramount importance. First of all, since centuries, the security of the Western Balkans was directly linked with the security of the whole Europe, and I would say, also with the transatlantic security. In fact, if there is turmoil on one of the two pillars of the Transatlantic Bridge, the other one will suffer likewise. This explains also the US engagement in the region, as everything today is more interconnected than ever. The security of the Western Balkans is not only essential for the security of Europe itself, but it is also relevant for the security of neighbouring countries, in the East as well as to the South. The Adriatic Sea is part of the Mediterranean security. The lesson of the Western Balkan countries that in few decades were able to overcome their conflicts and are today looking to regional stability and cooperation by pursuing common integration processes in the Euro-Atlantic structures, could represents an encouraging lesson to be learned by the MENA countries too. EWB: Regarding the US, the new US policy towards Europe in general, and the Western Balkans, is not yet clear. The US keeps having an important role in stabilising the region and resolving some of the open conflicts. Do you expect any changes in the US policy after the new personnel are in place for the region and Europe in general? FWL: I do not see a new policy regarding the new Administration towards Europe. Maybe the narrative and the way in which this policy is expressed is quite unusual in respect to the past, but the agenda is clear. I do not see changes in that direction. Also, because if we take into consideration how the Euro-Atlantic economies are interconnected, or if we look to the security field, the United States and Europe represents the half of the world’s economic and military power, and they will remain. Moreover, if we take into consideration the peacekeeping operations, I do not think that the US could resort to any other area of the planet to find better and interoperable Armies, and Administrations ready to defend our common and free democratic societies. EWB: Italy is a major economic partner for most of the Western Balkans countries, and it also plays very active role in the Berlin process with the Trieste Summit this July. How do you see the role of Italy in the Western Balkans and in the EU enlargement in the Western Balkans? FWL: From an Italian perspective, we feel the Western Balkans countries close – not only geographically. It is something embedded in the Italian DNA. Thus, Italy is not pursuing only its own national interest in the Western Balkans. We are pursuing our common interest. We share the same objectives. The Adriatic Sea is something that belongs to “us”. That is why we are working naturally for the same goals, shoulder by shoulder. It is a common feeling in Italy, as the people of the region are considered commonly as brothers. This offers to Italy an advantage in working with the Wester Balkans as well as in promoting its full integration into the Euro‑Atlantic institutions where Italy is an active member. Since the end of the Second World War, Italy was always believing that it can more effectively pursue its national interest by an active participation in the international organisations like the UN, NATO and the EU. Italy has always played an active role in these international organisations. At present, Italy is the first European peacekeeper contributor at the UN, the second largest contingent in the NATO operations in Afghanistan and Iraq, and is highly represented in the foreign affairs and security issues of the EU, and not only in this domain. Therefore, Italy can play, and has always played, a pivotal role for the Euro-Atlantic integration of the Western Balkans, by advocating the full integration process of the region. Trieste, in July, will represent another milestone in this process, as it take place in a moment in which there is a European fatigue towards the integration process, a phase in which Europe has to find and to redefine its identity, what it wants to be. We welcome the election of the new French President Macron, and we are waiting the outcome of the present historical election cycle that will soon affect Germany and Italy. In the meantime, the Berlin process and its Trieste Summit play a relevant role. It is a powerful tool to link the countries of the region by key infrastructure, and to connect the people with several concrete projects. There is the need for the civil society to feel that the international organisations are there and working for them, and delivering the benefits. It is the time to make it real. Trieste will be the right moment to show that we are working also towards the Small and Medium-size Enterprises (SME), a typical and successful Italian issue. Trieste will also devote particular attention to the successor generations by the implementation of concrete tailored programs. EWB: Would you consider yourself to be the optimist when it comes to the European future of the Western Balkans? FWL: It is not to be optimist or not, the way is there and the agenda is clear. There are no other options on the table. That is the future. Contatti – Mettere qui in fondo ed eliminare una pagina in alto?